Mike Cash, general manager of Kardoes. STOCKHOLM, Sweden—Hexpol A.B. has signed an agreement to acquire Kardoes Rubber Co. from Frank Kardoes, who founded the business in 1988, and his family for $31.8 million on a cash and debt-free basis. “The Kardoes Rubber acquisition is a very good complement to Hexpol Compounding in the U.S.,” said Don Picard, Hexpol vice president of sales and marketing. 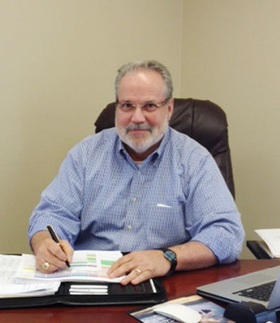 Hexpol plans to operate Kardoes' Lafayette, Ala.-based campus as Kardoes Rubber, a Hexpol Company, said Mike Cash, general manager of Kardoes. Cash will remain as general manager, and he said he will retain “our core management team and all production associates. A total of 90 associates, including management, work at the Lafayette location. Hexpol is a worldwide polymers group that focuses on advanced rubber compounds, gaskets for plate heat exchangers, and plastic and rubber materials for truck and castor wheel applications. Its customers are primarily original equipment manufacturers of plate heat exchangers and trucks, systems suppliers to the global automotive and engineering industries, the energy sector, and medical equipment manufacturers. 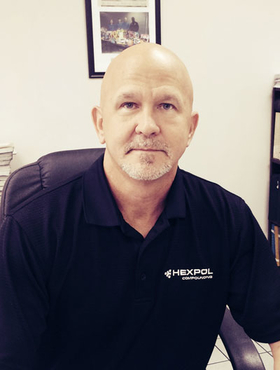 Don Picard, Hexpol vice president of sales and marketing. Hexpol is organized into two business areas: Hexpol Compounding and Hexpol Engineered Products. The group's 2013 sales were about $1.18 billion. It employs about 3,400 in 10 countries. The acquisition of Kardoes comes after Hexpol's acquisition of Robbins L.L.C. in late 2012. Robbins L.L.C. is recognized as the leading manufacturer of quality envelopes and curing tubes for tires, Hexpol said, as well as a U.S. rubber compounding company with a strong position in mining and agriculture. During the past year, Hexpol's NAFTA integration team introduced Robbins' business lines to appropriate Hexpol locations, merged the sales teams from both companies, implemented financial controls and cost reductions, and adjusted inventory levels to reflect the new business model and better serve Hexpol and Robbins customers. The Robbins L.L.C. brand within Hexpol recently developed a specialized tire market sales team to service the tire industry, including tire compounds, retreading options and specialty solutions. Hexpol's compounding plants, its GoldKey Processing Inc. in Middlefield, Ohio and the Hexpol Compouding's Statesville, N.C., facility recently received awards as the best places to work in their respective areas, the company said. GoldKey received the Cleveland Plain Dealer award as a 2013 Top Workplace, while the Statesville location was ranked in Business North Carolina, in partnership with Best Companies Group, in the top 15 for large companies in the state's Best Employers in North Carolina program. The company said it has been striving to add innovation to its lineup, including new investments at its plants in Mexico. A third 90 liter mixer line with inline gearpump has been installed at the firm's Hexpol Aguascalientes, Mexico, plant, and the company installed a state-of-the-art 135 liter mixer with inline gearpump at Hexpol Queretaro, Mexico. Overall, Hexpol's factories are designed to produce high-quality advanced polymer compounds for demanding applications using black and non-black mixers; gearpumps (inline and offline); calenders and performers; and auxiliary processes.